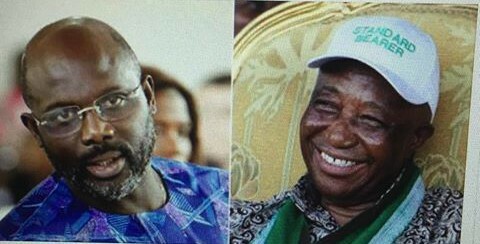 The former international footballer George Weah and Liberia’s vice-president, Joseph Boakai, will face a runoff for the country’s presidency on 7 November, the electoral commission announced on Sunday. With tallies in from 95.6% of polling stations, Weah took 39% of the votes and Boakai 29.1%, both well short of the 50% barrier required to win outright from the first round of voting held on Tuesday. Whoever wins the second round of voting will replace Ellen Johnson Sirleaf, Africa’s first elected female head of state, who is stepping down as president after a maximum of two terms. Jerome Korkoya, the chairman of the National Elections Commission, told journalists that 1,550,923 votes had been counted and turnout was at 74.52% across the small west African nation.